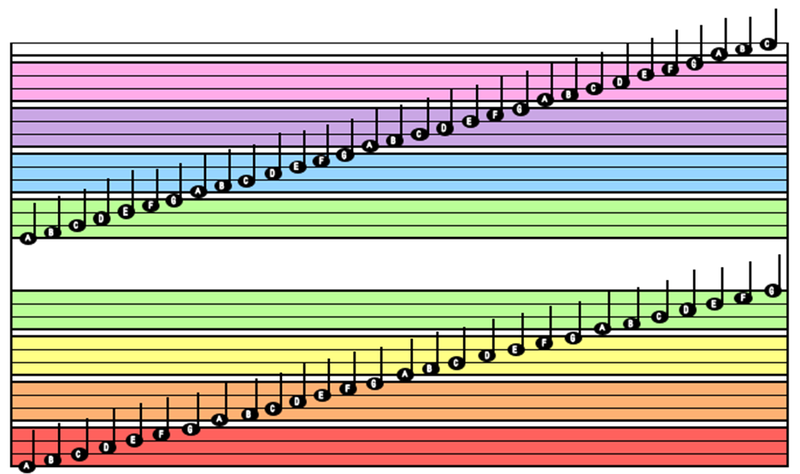 Color Coded Music (CCM) uses a four line three space staff to represent the seven white keys, A, B, C, D, E, F and G.
There are 8 groups of keys on the piano and these are represented by coloring each group in the order of the colors of the rainbow. Starting with red on the left, and moving across the piano to the right, orange, yellow, green, blue, purple pink, and then ending with white in the smallest group of keys on the far right. Each group of keys has its own staff. The staffs for the whole piano are below. Each staff is lettered the same for the whole piano. They will not all be displayed in a piece of music. Only the staffs used in a piece will be present. Sometimes partial staffs will be used to conserve space. See example below. The black key notes are diamond shaped and renamed, H, I, J, K, and L. They are located on the space and over the line of the white keys they come between. The H is located between the A and B keys, therefore the H note is on the B space and over the A line. All other music terminology will remain the same for eighth notes, quarter notes, half notes, etc. Colored lettered stickers are available to label the piano, much like our computer keyboards and phones are labeled. Example of “Be Thou My Vision” in CCM.